Hey everyone! In today’s episode, I share the mic with Rick Perreault, the CEO and Co-Founder of Unbounce, a landing page building tool that makes it easy to build and test landing pages quickly. This is his second time being a guest on Growth Everywhere! Check out the first episode with him here! 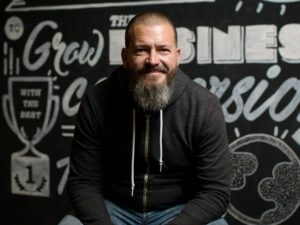 Tune in to hear Rick’s thoughts on how Unbounce brought in $30 million this fiscal year by going upmarket, why organization is a challenge for his growing company and how word of mouth is what drives conversions for them. [00:39] Before we jump into today’s interview, please rate, review, and subscribe to the Growth Everywhere Podcast! [01:45] Unbounce is a market-leading landing page and conversion platform. [02:05] The company started in 2009, when Rick wanted help creating landing pages, because he wasn’t a technical person. [03:00] Rick thinks he was naive five years ago, when the company was in its infancy. [03:39] Once you get past 70 employees, it becomes a different kind of company. [04:20] It used to be a lot easier to do an all-hands meeting on the fly. [04:40] This fiscal year, they made $30 million in revenue and 15,000 paying customers. [05:59] Unbounce went upmarket, because they already had those customers, but it was easier to keep them on. [06:23] By going upmarket, they found they were more successful. [07:42] A people-first business means that they are focused on company culture. [09:38] Unbounce has a great parental leave policy, so everyone can be with their children during those first few months. [10:03] Rick believes it is inexpensive and necessary to support your employees with great policies. [11:50] Unbounce holds a marketing conference every year in Vancouver. [12:03] They fly every employee in and they spend the week together at the conference. [13:33] One-on-one’s are encouraged for all employees with their respective managers. [15:55] Rick says he wants people to do great work, but not at the expense of respect for others. Not everyone is capable of handling this. [16:45] Word of mouth is still what drives conversions for Unbounce. [17:15] They have also published an ebook, run Google Ads, and other paid advertising methods. [18:20] Unbounce is launching a revenue share program called their Partner Program. [19:20] Unbounce looks for partnerships with like-minded companies. [19:30] They have done integration partnerships with Marketo, HubSpot, and Zapier. [21:45] Rick wanted to set a good example for his kids, so he wanted to create a great workplace for everyone, especially women. [23:45] Hiring the right talent is a challenge. [24:05] When you come to work and people tell you they are proud to work there, you’re doing it right. [24:25] One big struggle Rick faced when growing Unbounce, was alignment. [24:47] It’s hard to keep an organization the same as it grows. [25:20] Communication remains a challenge. [26:40] One tool Rick thinks has added value is getting an executive coach. [28:12] One book Rick would recommend is Lost and Founder.